A nurse by trade, Denice Raymond is well schooled on the price that multiple sclerosis exacts on the body. 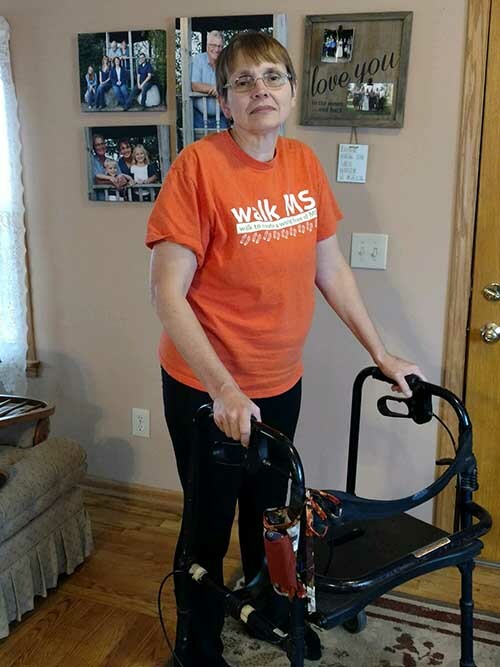 As an MS patient, she can also testify to the challenges of paying for drugs that might help her walk. Raymond is prescribed a drug that retails for about $60,000 a year – and while mostly covered by Medicare – that still left her with annual out-of-pocket costs of about $6,000. Raymond, a resident of Calhoun County east of Battle Creek, was grateful to find a nonprofit organization that agreed to pay the rest. A few months ago, her doctor suggested she take another to drug to improve her gait. Diagnosed with MS in 2002, Raymond gets around primarily by walker or wheelchair. But the new drug would have cost her several thousand dollars more a year: It was a deal-breaker. “There is no way we could afford that. It was either buy groceries or make an attempt to walk,” Raymond said. A newly released study by the University of Michigan’s Center for Healthcare Research & Transformation warns that Michigan’s roughly 15,000 patients with MS could face a crisis in paying for increasingly expensive medications known as specialty drugs. Many of these drugs, typically used to treat chronic or life-threatening illnesses, can cost more than $80,000 a year. The report notes that specialty drug prices went from 14 percent of total drug spending in Michigan in 2011 to 22 percent just three years later, a 42 percent rise. Some MS drugs have risen six-fold since their introduction in recent decades. The cost of MS drugs at introduction and cost today. The first of these drugs was introduced in 1993. Their date of introduction, cost then, and cost now. The report cited a few potential legislative solutions in Congress, which remain for the moment bottled up in committee. One would force drug companies to justify price hikes on these more expensive drugs; the other would allow the import of cheaper drugs from Canada. A solution on the way? The FAIR Drug Pricing Act: Introduced in May by Sen. Tammy Baldwin, D-Wisconsin, it would require pharmaceutical firms to justify price increases on expensive drugs. It has yet to emerge from committee. “Our bipartisan reform will require transparency and accountability for drug corporations who are jacking up costs for families in need of affordable lifesaving treatments,” Baldwin said at the time. The Affordable and Safe Prescription Drug Importation Act: Introduced in February by Vermont Sen. Bernie Sanders, it would allow Americans to buy American-made prescription drugs from Canada, where prices are lower. The MS drug Copaxone has an annual cost of $15,000 in Canada – less than one-fourth of its U.S. cost. The Congressional Budget Office estimates this law would save nearly $7 billion over 10 years. It has also drawn concern that imports could threaten drug supply chain security. It, too, has yet to come out of committee. Pharmaceutical firms and health products companies spent nearly $250 million lobbying Congress in 2016. One study found that Midwestern states had a rate of 165 cases of MS per 100,000 people in 2012, compared to the national average of 149 cases per 100,000. In general, insurance covers the bulk of the cost of specialty drugs. In some cases, pharmaceutical firms will discount the cost of expensive drugs to needy patients. Nonprofit groups dedicated to helping patients pay for rare and high-cost drugs help as well. But both private insurance policies and coverage under Medicare have gaps that can leave MS patients forced to pay thousands of dollars a year in out-of-pocket costs. Some employer-sponsored health plans force consumers to pay a percentage of these higher-priced drugs rather than a set co-pay. According to a 2015 study by the Kaiser Family Foundation, a range of MS drugs covered under Medicare left patients with annual out-of-pocket costs of $6,000 or more. It also found that cancer patients on a drug known as Revlimid can face annual costs of nearly $12,000 a year. There is no cure for MS, a chronic disease of the central nervous system. Its cause is unknown, though it is more common farther north of the equator and more prevalent among people from northern Europe and Scandinavia. Recent research suggests there may be a bacterial link to the disease. Until a couple decades ago, there were no effective treatments to slow its progress. But in 1993, a drug called Betaseron showed promise in reducing the number of relapses in MS patients and in slowing the progress of the disease. There are now 15 so-called disease modifying therapies for MS approved by the U.S. Food and Drug Administration, with evidence they are effective in at least curbing the disease’s progression. Drug companies defend their high cost, citing the large research investment involved in development of MS drugs. But patients like Mount Pleasant resident Dan Digmann wonder how drug companies can justify a four- or five-fold increase in the cost of a drug since its introduction. Digmann has been taking Betaseron since 2000, the year he was diagnosed with MS. He recalled it cost $16,000 a year then. Now its price exceeds $80,000. Ferndale resident Ann Serafin began a new MS medication earlier this month that has an annual cost of more than $80,000. Her primary insurer is Medicare, so she is unsure how much she might have to pay herself. She recalled that in 2008 she tried another MS medication that cost nearly $30,000 a month. She found a national nonprofit group that helps pay for rare and expensive treatments. It agreed to cover its cost. But after two months, Serafin quit taking it. Now, she’s nervous about what added expenses might come her way with her new medication. 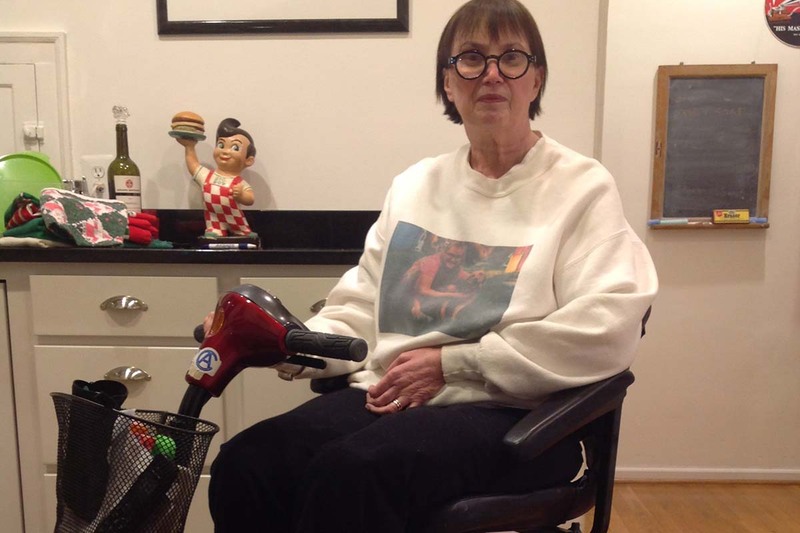 Diagnosed with MS in 1990, she no longer walks and uses a scooter to get around. Everything should be negotiable, even drug prices. We need to remove the law that medicare prices can not be negotiated. I once worked at a company that was buying pre-production prototype parts. When we looked into what made those parts so expensive, and looked at alternative methods, the price dropped from "whatever the market will bear" to "here is a reasonable calculated cost for this part". It is hard for my analytical brain to comprehend how something could go from $11,000 to $80,000 especially since all development costs should have been recovered when the drug was at the $11,000 level. 1) We are all going to die. 2) Drug companies realize that some dispute #1 and will charge whatever they believe people will pay. 3) Our legislators do not believe we should ever challenge what medical care and drugs cost. I guess replacing legislators might be a start to solving the problem. Some very good points. Problem comes in medicine is far from a free market, almost no one pays for the services and drugs they receive, no one neither the provider nor the recipient ever say NO that costs too much so I'll go a difference direction or no I won't sell that for that price. And finally there is so much room for cost shifting that sure the government may negotiate a great price, the indigent receive care but then these costs are shifted onto less powerful payers. I suspect that the only way around this is to have two completely separate medical systems one public pay with limits to what's accessible and the other private pay with no crossover limited only to by your ability to pay. My husband, a physician, died young of complications from ms. He was unable to move or speak. I wish there were drugs available during that time. I wouldn't want any ms patient to go through what he did. If these drugs are so expensive that no one can afford them, the drug companies are stuck with drugs no one will buy. They are flush with money. I wonder how much their CEOs are making? Nothing will change with the Republican Party in control. They listen only to the super wealthy and large corporations who give them large 'campaign contributions' (AKA legal bribes). The drug companies understand that and contribute heavily to legislators. Until everyone stops listening to the GOP lies and votes the GOP out of power nothing will change. Just new set of myths, lies, etc. to convince the ignorant that all these kinds of injustices are because of immigrants, Muslims, 'liberals', etc. is continually rolled out to divert people's attention from the truth. Rick, you are very quick to blame the Republicans. Don't forget that Democrats controlled the gov't for many of the years involved in this outrageous cost of specialty drugs too. Politicizing the issue will not correct it. Both parties are cut from the same cloth....the problem is that politics has become a power and wealth proposition for those in control. The issue of price boils down to the very basic issue that no one looks at the price of medicine today except possibly some bureaucrats who are probably on the payroll of the drug companies too. If everyone had to look for the best price themselves, things would be much cheaper I believe. Get the gov't out of controlling medical and pharmaceutical industries to require that people be responsible for themselves again and prices will be affected dramatically. Unfortunately I can't afford the copays for copaxone now that I'm on medicare. Have other meds, office visit copays etc... I've been told I'm over income by 1200 dollars for Medicaid. Have been redirected to change diet, exercise and meditate. Blessing in disguise, no doubt I'm taking chances...i hope we get a solution soon.